I shared a sneak peek at this suit during the Target try on I shared in the LTK app / my instagram stories. I was so impressed that Target was carrying work wear that was not only affordable but good quality. This baby blue pant suit is by A New Day. 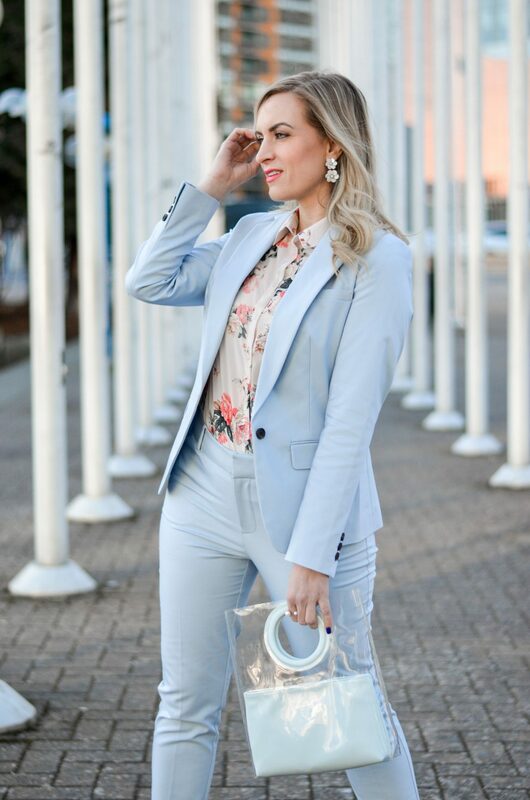 This baby blue pant suit is such perfect work wear for spring. 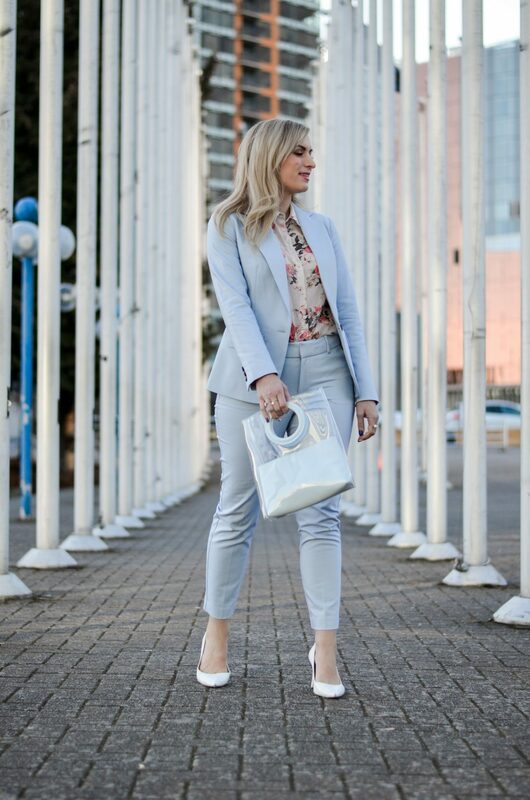 The softer color palette fits the warmer temperatures (… and brighter moods lol) and the classically cut blazer and slim fit pants are very professional looking. Given the affordable price point I wasn’t sure what to expect as far as quality – but I have now worn this suit to work 4 times and it still looks and fits great. I’ve actually had Court staff stop me in the halls to compliment this suit – I don’t think that’s every happened before! It is definitely a crowd pleaser / well-loved outfit. 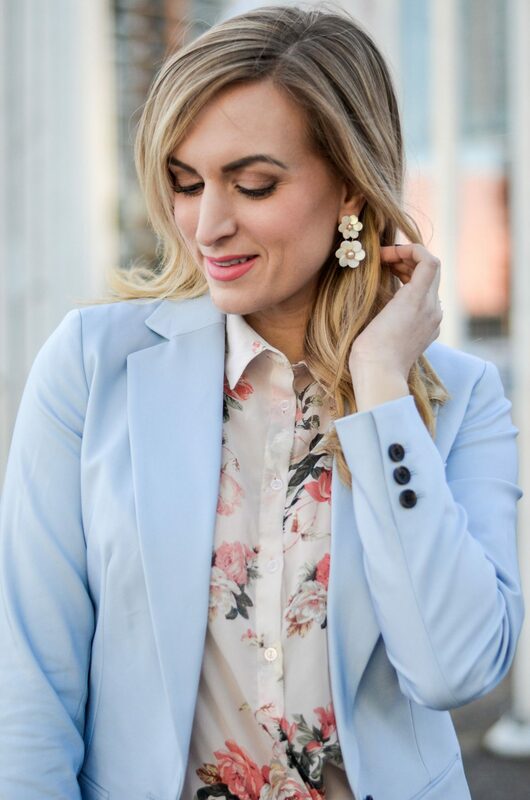 To keep things spring-y for this look I went a floral blouse that has been in my closet for a few years. You can’t go wrong pairing this suit with a white button down or any soft floral top. I also couldn’t help but style it with my new plastic / baby blue handbag. The plastic trend is everywhere this spring/summer (it is this season’s rattan) and I love the unique shape of this one – and that it is super affordable. It also comes in 2 other colors if you’re interested! I hope you all have an amazing Friday and great weekend ahead. After Court today I don’t have much planned specifically so that I can focus on resting and getting over this bug! Lots of TV watching in my near future haha. I just finished Shameless which was such a great show. I sobbed like a baby in the series finale! Now I need a new show (or two). Since I will probably be in bed for the next 2 days, I would love if you could drop me your best Netflix and/or podcast recommendations! "The Denim Brand You Need to Know This Spring"
"Real Talk: Why You Should Go To Therapy"
This baby blue is totally your color! Loving the whole look! ooh I love the color of this suit! I also love the pop of floral! Thank you!! Im actually wearing this suit as I am writing this haha. On my lunch break at work! This might be one of my favorite outfits of yours! I loveee the light blue the floral top and those fun earrings! 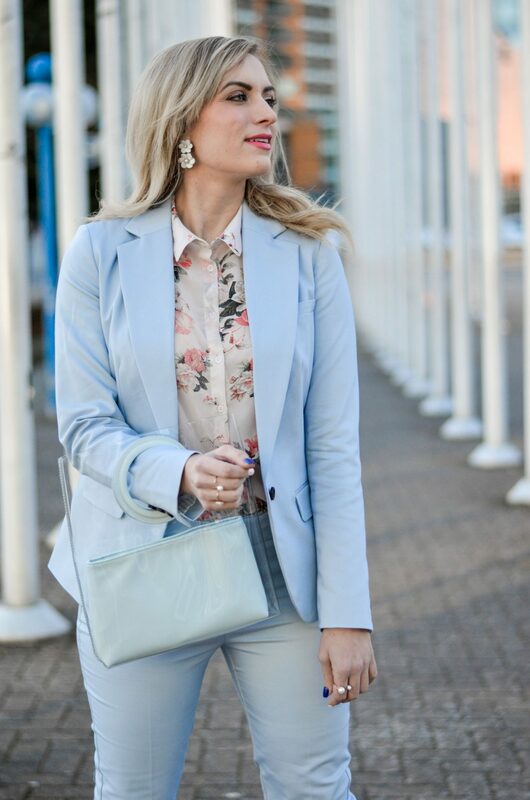 This powder blue suit is gorgeous, I love how you styled it with an ultra feminine floral blouse! Target really seems to be stepping up their fashion game these days! What a fun suit to pull out for spring. Hope you get lots of rest this weekend and feel better! Thank you so much! I plan on doing nothing all day today and hopefully will be on the mend by tomorrow! This baby blue color looks perfect on you! I can’t this suit is from Target…such a great find! Thanks so much! And i know right! Such a surprising / amazing find!! Can’t believe this is from Target. I love everything about it. So so chic and professional. I know right! I still can’t believe it either! I’m legit 110% obsessed with your suit. That is a POWER suit if I ever saw one. And I’m so in love with how you styled it. Giiiirl. YES.. This is such a cute pairing. I love how the floral print pops against the blue! Such a cute outfit, the baby blue and floral patterns go together so well! This blue pantsuit looks so good on you! Thank you so much Madison!! Beautiful! I love suits and this color is so perfect for now! Love your nails too! Literally obsessed with this on you! It looks amazing. 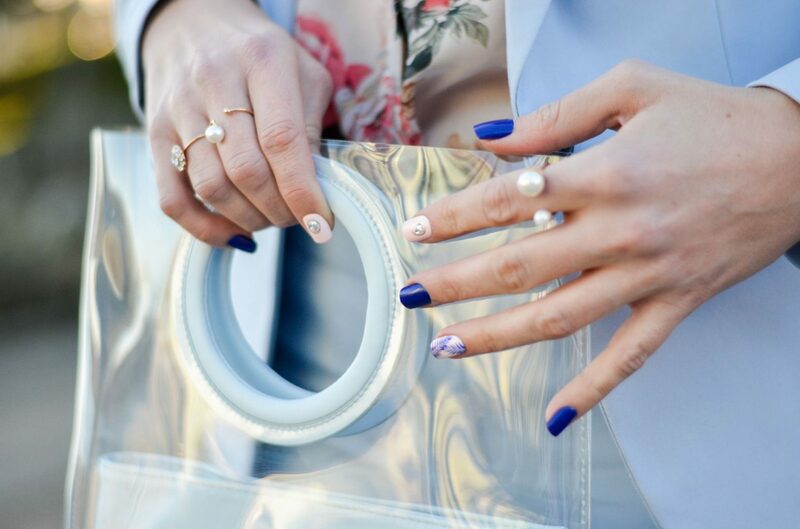 And OMG your nails – they are fabulous gal! Aw thank you! and they’re fun eh! I’m loving my baby blue pants this year but a whole pantsuit is even better! I’m glad pantsuits are back and that they’re very colorful! What a fun way to dress up work wear! I totally agree. If I had to wear the shapeless black pant suits of the early 2000s every day i would be so miserable lol. Yay for colored suits in flattering cuts! Nice outfit & you look gorgeous. Thank you for sharing such a nice post. Cheers!